ThinkHealth provides counseling centers an enterprise-wide solution for practice management. From ThinkHealth’s main screen, clinicians and support personnel have access – based on login profile – to the several modules that make up this industry-leading resource. The modules are Staff Registry, Screening and Assessments, Client Data Core (CDC), Patient Management, Treatment Plans (Prior Authorization), Scheduling, Activities & Notes, Billing, Reports Manager, Document Management, and Health Information Exchange (HIE) Network. ThinkHealth’s members provide active direction in the development of the system to insure that it meets user needs. The ThinkHealth system is one of the best values of any practice management software on the market today. Thanks to our competitive pricing, our customers are able to save money while also increasing productivity. The average Return On Investment for some of our clients is 110% in just the first year of use. When you become a ThinkHealth member, you get an enterprise software system designed to assist counseling centers with daily operations, making sure that every Progress Note you write is accurate and available for audit and review. It reduces data entry errors and applies validation checks to ensure Treatment Plans are fully completed, which results in fewer rejected claims. Not only do you get a top-of-the-line software solution, but you get the ThinkHealth support and development team. Just ask any of our members how it pays to be a member as we help your business grow, responding to you and other members to improve what already is the best value in practice management software. When the application starts up, users are taken to their Inbox to get system alerts and patient updates and notifications about tasks that require the user's attention. 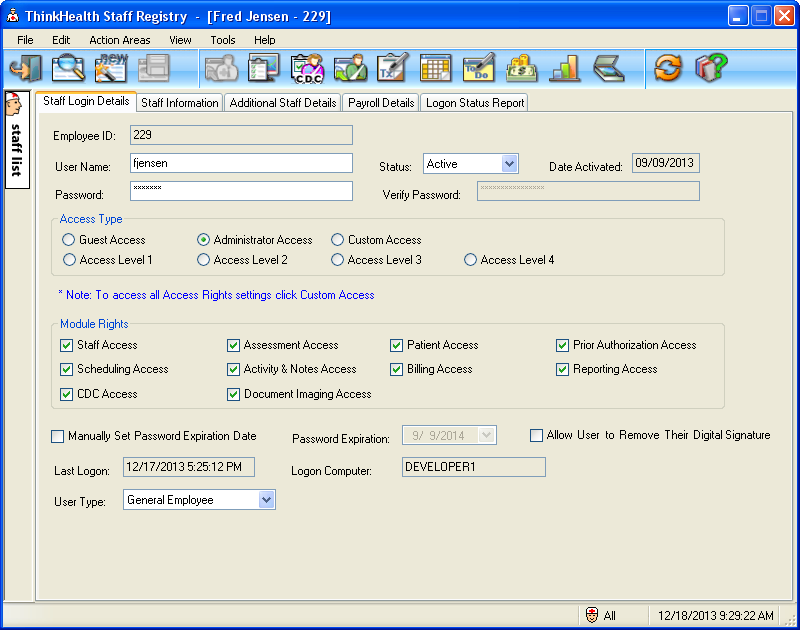 Set up usernames and passwords for your staff members, and determine their individual access rights. Let the ThinkHealth staff payroll keep track of your employee salaries, hourly rates, or contracting pay. Upon completion of an assessment, the information flows from the assessment to the treatment plan and virtually fills in the treatment plan for the clinician so that all they have to add is problems and goals. When entering problems and goals, you are able to use a template to ensure consistency from plan to plan across the agency. 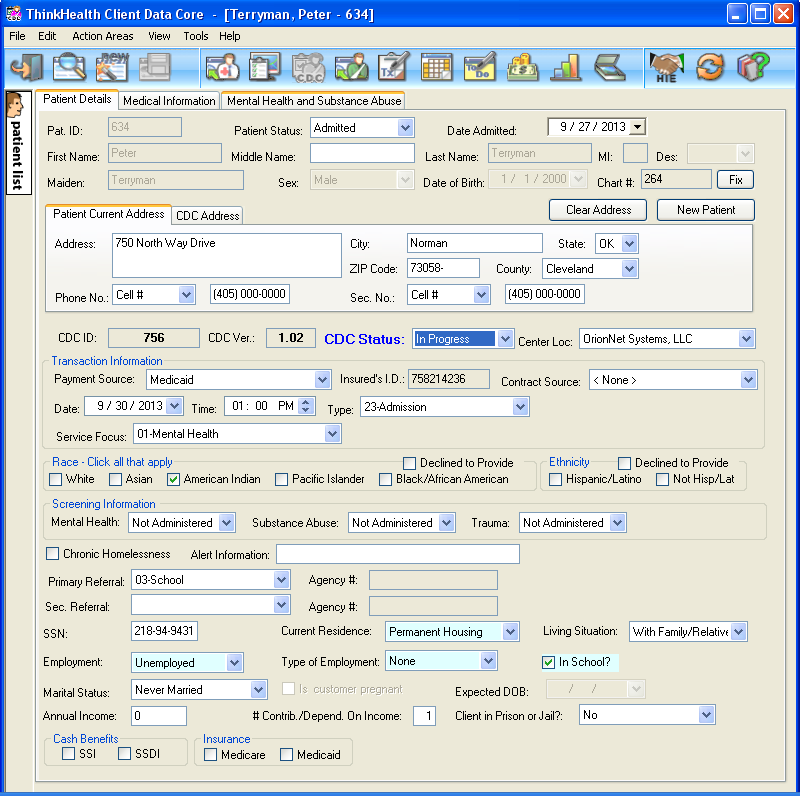 Current customers love that the client information that they enter flows throughout the software eliminating the need for duplicate entry. In the CDCs module, you can validate CDC’s and PAs and get INSTANT responses from DMH if there are any mistakes or errors. This allows the clinician to fix them as they are creating the CDC or PA. Client address information can flow automatically to the emergency contact and insurance contact information. You can also document your client’s family members that are being seen at the same agency. When you document the relationship, the corresponding family member chart will automatically update with the respective relationship. In the Treatment Plan (PA) module, use frequently used phrases that are saved to quickly fill in your treatment plan. When doing an extension, automatically copy the entire plan from the initial to the extension in one click. Depending on the level you choose on the treatment plan, ThinkHealth will check to make sure the CAR or ASI/T-ASI scores are appropriate for the level requested. ThinkHealth will also alert you when your scores don’t match the level you asked for. Easily schedule appointments and quickly look through the calendar to see all of your notes for the appointments that day. 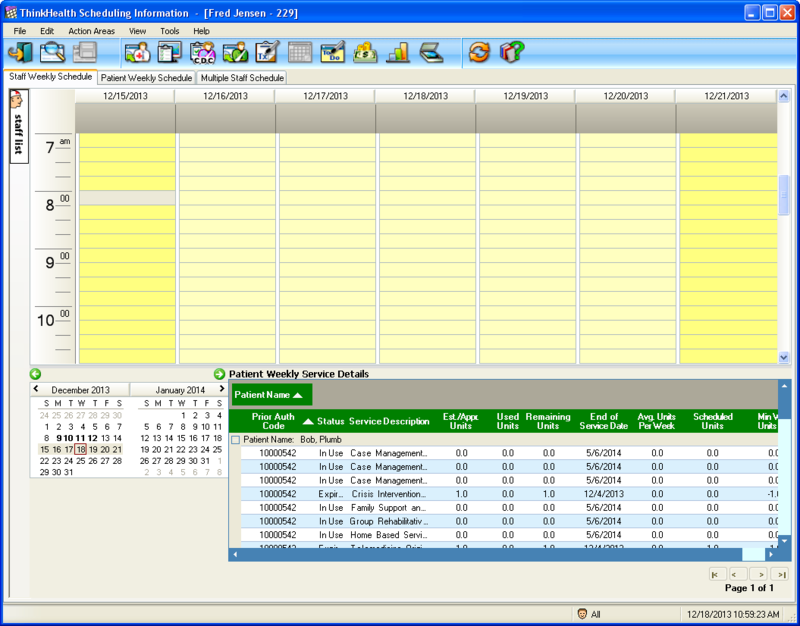 You will also be able to see how often a client is seen on a weekly basis. Schedule personal time blocks to indicate personal scheduling needs. Among these benefits is the ability to directly create a progress note that is generated from the appointment, minimizing re-entry duplication. Administrators can view all appointments from staff members and audit the amount of times that clients are seen in the past and future. As treatment plans are approved in the system or by a state agency, the details also flow through the system and are used by the Progress Notes module. From this module, clinicians can have their staff write and review progress notes - either on or off-site - and the information still flows into the ThinkHealth system. After a Progress Note is written and approved, the system sends the information into the Billing module where it is batched for payment and sent to your billing entity of choice. Save time and money by using automated billing and uploading billing in seconds. Bill private insurance by uploading to the accepted clearing house vendors or by HCFA 1500. Electronically receive your remits every week to quickly run payroll. Manage your write offs and voids so you can accurately report your pro bono hours for accreditations. 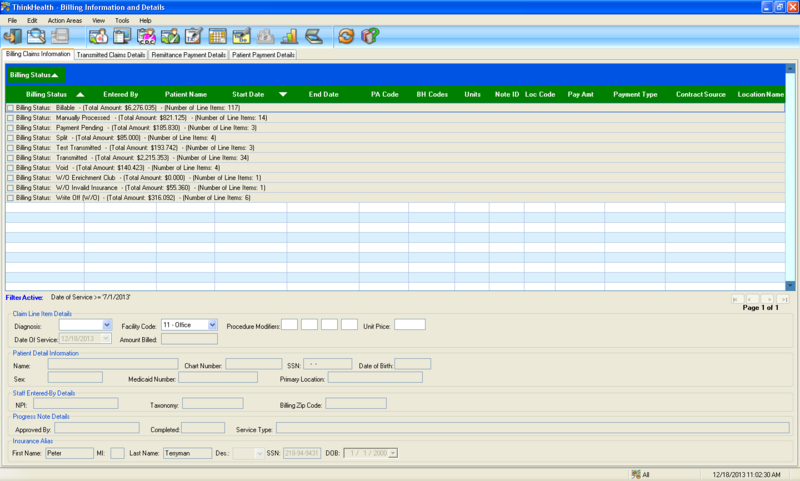 Run a Staff Payroll report that will automatically calculate the percentage of claims billed to your clinicians. Because the system handles and checks all the details, billing in the ThinkHealth system is nearly seamless. Print reports that explain to the clinician why they did not get paid for certain claims. Run reports to see clinician utilization and demographic information. These reports will directly help you with the reaccredidation process. Save reports that you frequently run so you can quickly get back to them and run them again for the new week. New modules and features, some of which we are moving through the patient process that greatly enhance our customers business, are being developed by OrionNet. ThinkHealth works seamlessly to upload client data into the HIE network where all medical records are shared between participating providers. Scan documents into the system and keep track of them in the archive. This alleviates the need for file cabinets and stacks of paper. Quickly retrieve the document at any time. Organization has never been easier! ThinkHealth product has been developed and specifically tailored for the behavioral healthcare market. 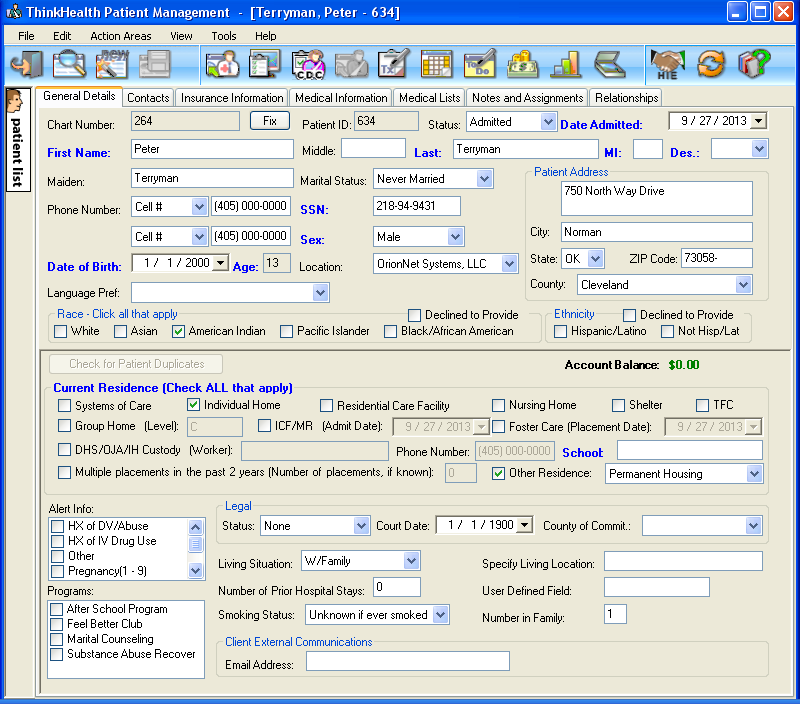 This product was designed to assist with tasks such as assessments, client intake, treatment plans, scheduling, creating notes, and billing. 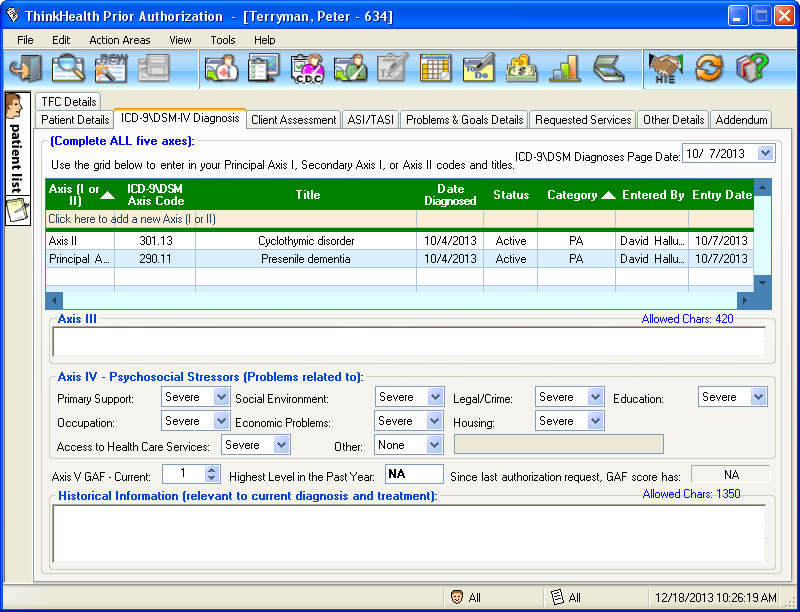 By using the ThinkHealth desktop, centers can track their staff and client information. The software’s Treatment Plan (PA) module allows centers to fill out all the data needed to work with most state rules and approved forms. We work diligently to keep the system updated according to the latest rules and changes. Our customers receive free updates so that their documents are always compliant. Using unique proprietary techniques, clinicians are able to produce treatment plans for their clients in a much shorter time. What it is: Set up usernames and passwords for your staff members. How it functions ThinkHealth will keep track of your employee salaries, hourly rates, or contracting pay. Benefits: ThinkHealth will determine access rights for the individual who is logging in. What it is: Fill out an assessment for a new or existing client. 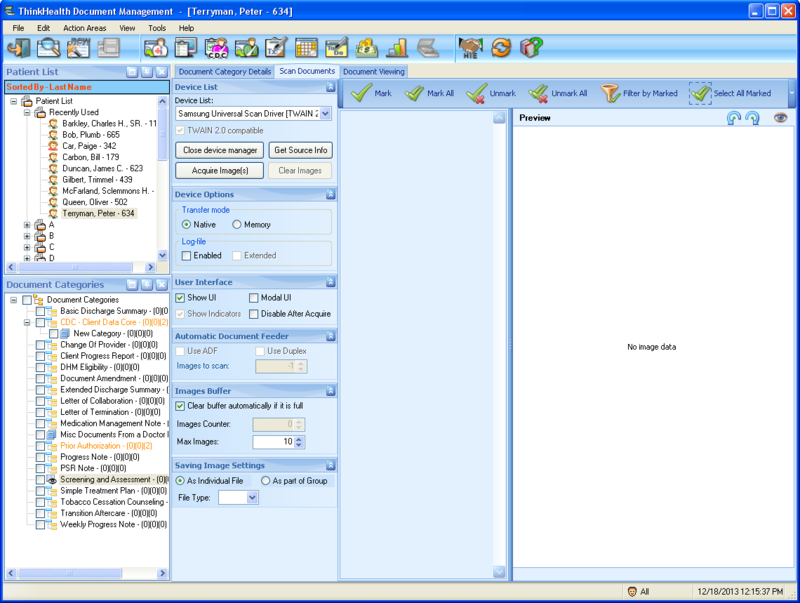 How it functions When the client information is entered, it flows throughout the software eliminating duplicate entries. Benefits: Upon completion of an assessment, the information flows from the assessment to the treatment plan and virtually fills in the treatment plan for the clinician so that all they have to add is problems and goals. 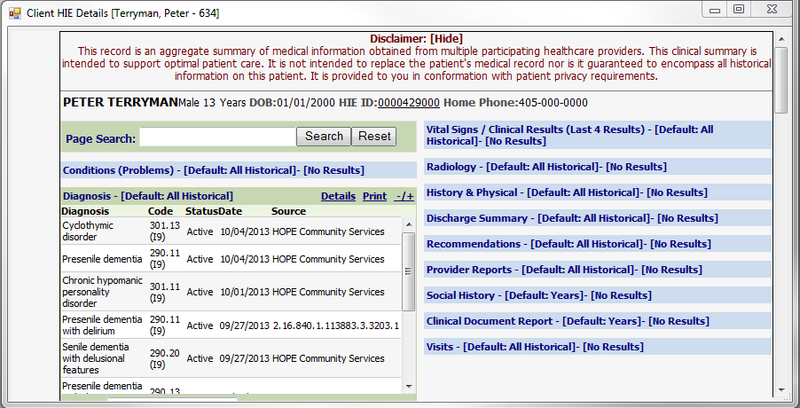 What it is: Add, edit or delete CDCs and attach them to treatment plans so they never get lost. How it functions In the CDC module, you can validate CDCs and PA’s and get INSTANT responses from DMH if there are any mistakes or errors. This allows the clinician to fix them as they are creating the CDC or PA.
Benefits: The system will alert you when CDCs expire every 6 months. What it is: Save all client information in this module for future use. How it functions Client address information can flow automatically to the emergency contact and insurance contact information. Benefits: You can also document your client’s family members that are being seen at the same agency. When you document the relationship, the corresponding family member chart will automatically update with the respective relationship. What it is: In the Treatment Plan (PA) module, you are able to enter the treatment plan and save it directly to your computer. How it functions The transmit area easily uploads the treatment plans and internally checks them for errors. Benefits: When doing an extension, automatically copy the entire plan from the initial to the extension in one click. Frequently used phrases that are saved to quickly fill in your treatment plan. ThinkHealth will also alert you when your scores don’t match the level you asked for. What it is: Easily schedule appointments and look through the calendar to see all of your notes for the appointments that day. How it functions Enter a new patient, schedule an appointment and send it all directly to your clinicians. Benefits: You will also be able to see how often a client is seen on a weekly basis. What it is: From this module, clinicians can have their staff write and review progress notes - either on or off-site - and the information still flows into the ThinkHealth system. How it functions As treatment plans are approved in the system or by a state agency, the details also flow through the system and are used by the Progress Notes module. Benefits: Copy a progress note from one session to another to help quickly fill out group notes. Save phrases that are commonly used per clinician to write a note and eliminate the need for printing the note, you can digitally sign them. What it is: Save time and money by using automated billing and uploading billing in seconds. How it functions After a Progress Note is written and approved, the system sends the information into the Billing module where it is batched for payment and sent to your billing entity of choice. Benefits: Manually bill private insurance using the commonly accepted HCFA 1500 form and also print invoices and receipts. What it is: Print reports that explain to the clinician why they did not get paid for certain claims. 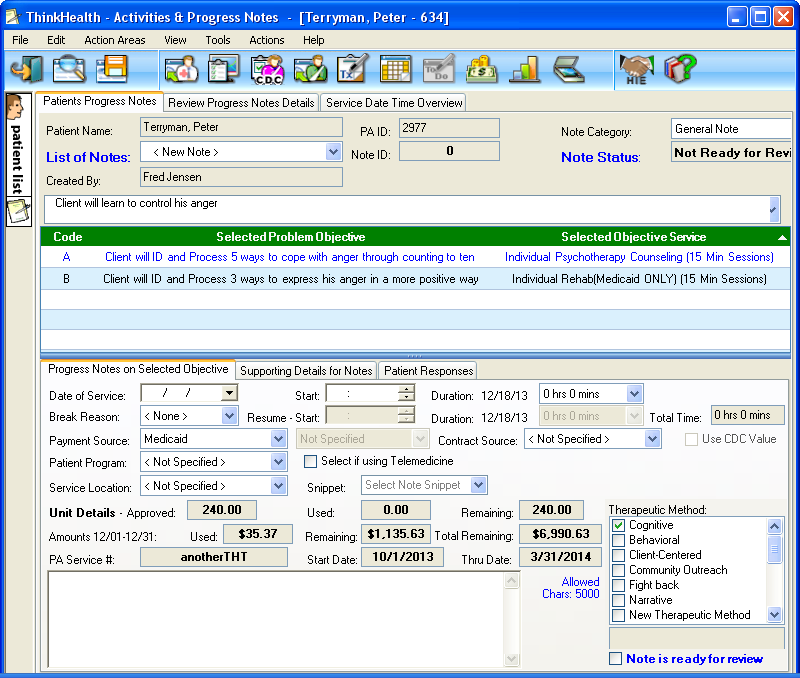 How it functions Run reports to see clinician utilization and demographic information. These reports will directly help you with the reaccredidation process. Benefits: Save reports that you frequently run so you can quickly get back to them and run them again for the new week. What it is: Healthcare Information Exchange. How it functions Upload client data directly to the HIE network where all medical records are shared between participating providers. Benefits: Client data is easily available to you and able to be shared with other personnel. What it is: Scan documents directly into the ThinkHealth system. How it functions After documents are scanned into the system, you can keep track of them in the archive. Benefits: Quickly retrieve the document at any time and alleviate the need for file cabinets and stacks of paper.